NASA’s Scott Tingle, Anton Shkaplerov of the Russian space agency Roscosmos, and Norishige Kanai of the Japan Aerospace Exploration Agency joined Expedition 54 Commander Alexander Misurkin of Roscosmos and crewmates Mark Vande Hei and Joe Acaba of NASA aboard the International Space Station when the hatches between the Soyuz spacecraft and the orbiting laboratory officially opened at 5:55 a.m. EST. The welcoming ceremony will begin shortly. The crew members will spend about six months conducting approximately 250 science investigations in fields such as biology, Earth science, human research, physical sciences and technology development — research that impacts life on Earth. 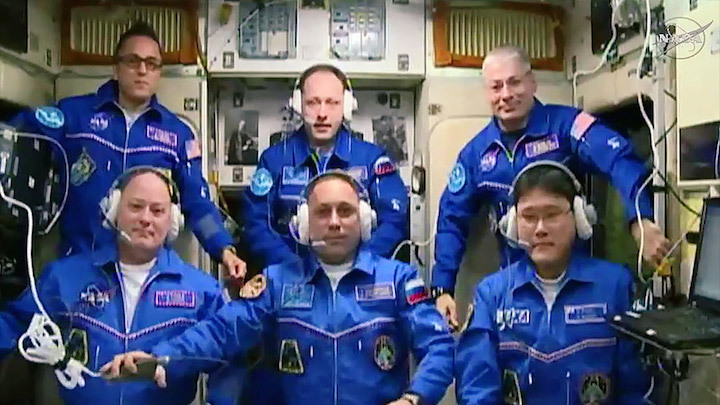 Vande Hei, Acaba and Misurkin are scheduled to remain aboard the station until February 2018, and Tingle, Shkaplerov and Kanai are scheduled to return to Earth next June. This crew continues the long-term increase in crew size on the U.S. segment from three to four, allowing NASA to maximize time dedicated to research in the unique microgravity environment. Highlights of upcoming investigations include demonstrating the benefits of manufacturing fiber optic filaments in a microgravity environment, a new study looking at structures that are vital to the design of advanced optical materials and electronic devices and examining a drug compound and drug delivery system designed to combat muscular breakdown in space or during other prolonged periods of disuse, such as extended bed rest on Earth. For live coverage and more information about the mission, visit: www.nasa.gov/station. Get breaking news, images and features from the station on Instagram at: @iss, on Facebook, and on Twitter @Space_Station and @ISS_Research. Follow Twitter updates from NASA astronauts Joe Acaba, Mark Vande Hei, and Scott Tingle as well as from Anton Shkaplerov and Norishige Kanai.